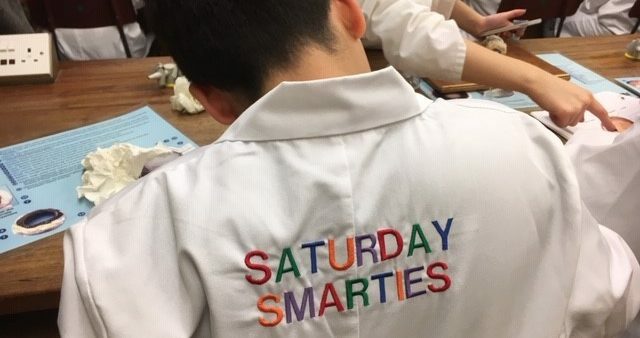 We welcomed our first two groups of Saturday Smarties this academic year with a spectacular two hours of science fun. 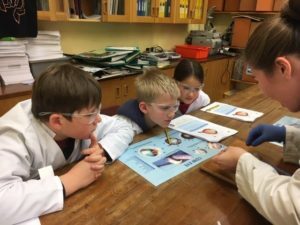 Two groups of pupils from across 17 local primary schools took part in our “rainbows, eyeballs and fireworks” sessions on two consecutive Saturdays. On arrival the children were kitted out in our fantastic new Saturday Smarties branded lab coats and given a workbook. 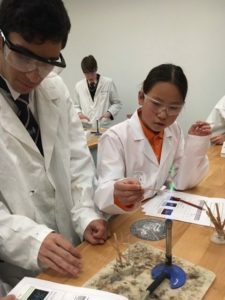 Any initial nervousness was soon gone as they entered the science labs and started experimenting with light, working with our King’s School scientists and staff. Using prisms they created a spectrum – learning about wavelengths and colour. For the next part of the session the Saturday Smarties moved up to our biology labs to have a hands on session dissecting eyeballs. A mixture of fascination and horror met our King’s School scientists who dissected the eyeballs working with two or three children in each group. Many of our Saturday Smarties became quite brave and were keen to squish and poke the various parts! After a clean up the pupils moved back to the Chemistry labs where they learnt how different elements burn and explode. Using bunsen burners for the first time they worked with our volunteer student scientists to make different coloured flames and then, with fingers in their ears, were able to see some spectacularly colourful explosions. This led to a discussion about nebulas and the possibility of life on other planets. On leaving the pupils were each given a certificate and a tube of Smarties for all their hard work. They took their worksheets home to share with their schools, family and friends and are all really looking forward to their next session in January.